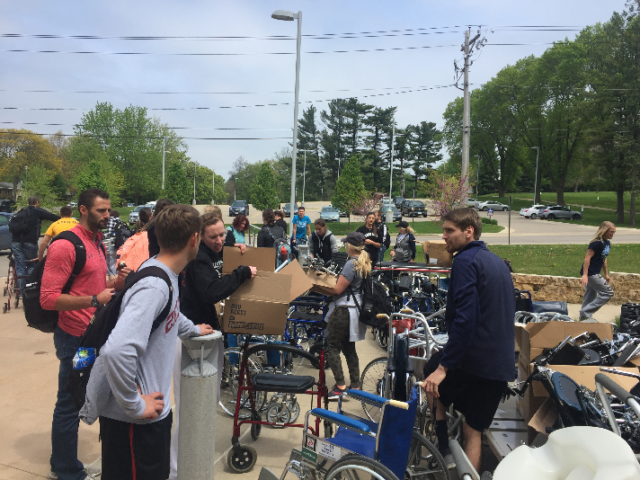 The Clarke University Organization of Student Physical Therapists (COSPT) is again seeking donations of used or broken wheelchairs, walkers, crutches, or canes. COSPT will collect assistive devices from 8 a.m. to noon on Saturday, April 13, at the main entrance of Catherine Byrne Hall on the Clarke campus. If unable to donate that day, please call (563)588-6382 to make arrangements to drop items off in the Physical Therapy office in the main lobby of Catherine Byrne Hall. The items will be donated to Wheels for the World, a non-profit organization that refurbishes the devices and sends them to countries without access to such devices. Wheels for the World collects the items that are refurbished by inmates at a correctional facility in Kansas. The wheelchairs are then shipped worldwide where teams of physical or occupational therapists, wheelchair mechanics, and others assist with distribution. The gift of a wheelchair or other assistive device can transform the life of a person with a disability. Clarke University will celebrate its 175th anniversary throughout the 2018-19 academic year. Founded in 1843 by the Sisters of Charity of the Blessed Virgin Mary, Clarke is located near the Mississippi River in the thriving city of Dubuque, Iowa. It is the only BVM university in the country. Clarke is a Catholic, liberal arts and sciences university dedicated to preparing students who positively impact their workplace, family, and community. Academic offerings include 37 undergraduate liberal arts and sciences and pre-professional programs, and six graduate degree programs.